Russell Westbrook scored 33 points and dished out six assists in a 102-93 Thunder victory over the Lakers. “Your flight is canceled?” he was heard shouting into his cell phone after the game. “Damnit Ed! You just cost me everything.” With a weary sigh, he put on his clothes. Reporters watched in puzzlement as he strapped what looked like a set of explosives around his chest. “There’s only one way to stop them,” he said. Sources report that former Dodgers owner Frank McCourt will not receive any parking revenue under the terms of his joint ownership of land around the stadium, and will only make money if the land is developed. 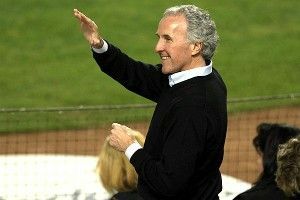 Late last evening, a distress call from a neighbor of McCourt’s indicated that a famous basketball player in town for a game entered the owner’s house by force. Police surrounded the home as the hostage situation developed. Rick Pitino will not make the Basketball Hall of Fame this year, a source reported. “I’ve done some bad things,” Pitino told reporters. “But I couldn’t do what they told me. Not murder. Not murder.” He was found on the floor of the team locker room in New Orleans by custodial staff this morning, a collar around his neck and the word ‘Unfaithful’ written in soap on the mirror. Reports out of Tuscaloosa indicate that Crimson Tide running back Trent Richardson impressed scouts and and other NFL personnel at Alabama’s pro day. When reporters found him after the game, he was standing by his locker holding what looked like a detonator with a red button. His phone rang, and the words “Chris is collared” could be heard, tinnily, over the speaker. As he closed the phone, his face going ashen, reporters asked him about the detonator. “It’s insurance,” he said. “The kind I hoped I’d never need.” What does it do? they asked. “Around here, not much.” He closed his eyes and took a deep breath. “I’m sorry, Russell,” he whispered. “I’m sorry.” A single tear ran down his face. And then he pressed the button.